Besides meeting with some of our Doxie friends at the Edmonds off-leash dog park (our favorite) and visiting with family, we spent the weekend preparing for our vacation next week. 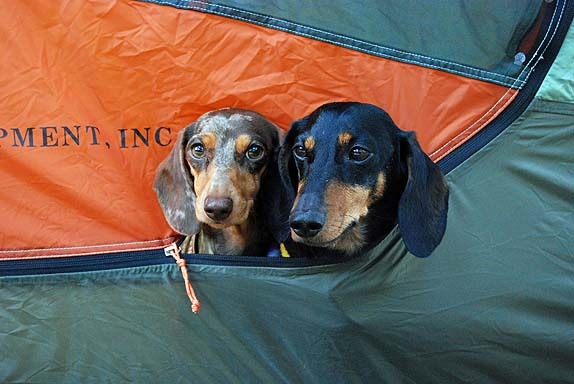 We plan to start off the week with an overnight backpacking trip with the dogs and then we head off for a mini bike tour of the Oregon Coast. The big project this last weekend was digging out all of my backpacking stuff from the various corners of our gear room. It has, sadly, been way too long since we have gone backpacking but I have done this a lot so this was more of an exercise of making sure I could find everything and it was in working order. Sleeping Stuff: tent, sleeping bag, sleeping pad and an inflatable camp pillow or pillow case to stuff clothing in as a makeshift pillow. Safety and the 10 Essentials : first aid kit (I’ll tell you what is in mine later), topographic map (on waterproof paper on in a large plastic bag), compass, lighter and waterproof matches (you should always have two sources with you), fire starter (for emergency. In almost all cases fire is not allowed in the backcountry), notepad (write in the rain), pen and pencil, sunscreen, sunglasses, headlamp with extra batteries, small pocket knife and emergency whistle. Eating and Drinking: people food and snacks, camp stove, wind screen, fuel canister, Water filter, iodine tablets in case your water filter fails), 2 collapsible water bottles, cup, pots, pans, silverware, plate, bowl, mini cutting board, dish towel, sponge and Camp Suds. Toiletries/Restroom Items: baby wipes for hands and face and whatever, anti-bacterial hand gel or towelettes, toothbrush and toothpaste, lotions and other beauty items, mirror (can double as emergency signal mirror), bug repellant, small, quick-dry towel, poo shovel and toilet paper. Clothing/Warmth: 1 pair shorts, 1 pair pants, two or three shirts, Smartwool socks (what you think you will need plus one extra pair), long underwear, emergency rain gear, gloves, hat, sturdy hiking boots and sandals to wear at camp. Dog Necessities: dog food and snacks (our favorite is Zuke’s Power Bones), leashes and harnesses, dog jackets, small towel (to wipe them off and for them to lie on), 2 REI 18 Flash Packs (see why here), dog poo bags, collapsible water dish, carabineers (for quick tie off for leash without a knot), proper identification and vaccination records. Parachute cord – for emergencies such as broken shoe laces, to hang your food to keep it away from animals, to strung between two trees as a runner for your dogs, and as an emergency leash if yours breaks. Tiny roll duct tape – to repair holes in your tent or rainfly, to cover blisters and really, any emergency because what CAN’T you use Duct Tape for right? 4 – 13-gallon garbage bags – to carry your trash our of course (double bagging this is a good idea). They also work as an emergency poncho or a bag to carry wet clothes in. 5, quart-size ziplock bags (the thicker freezer kind is the best) – This may be gross but the main reason for bringing these is to double, or triple, bagging the poo before carrying it out if you are unable to bury it. Trust me, this will be a life saver. They can also be used for less gross things like separating small items in your backpack and storing leftover food. Playing Cards – for something to do in case it rains or at night. iPod/headphones or earplugs – helps to drown out the noise from other campers or a snoring tent partner when you are trying to sleep. 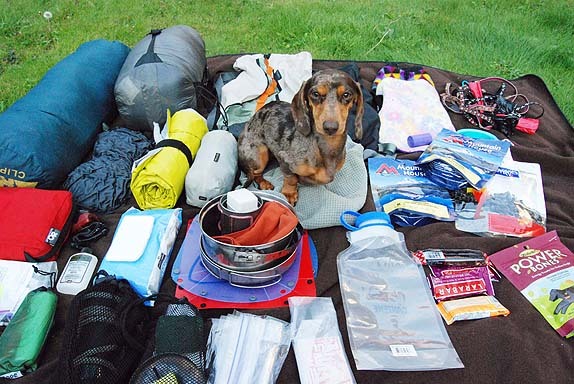 This list is to cover one night of backpacking. For muntiple nights just add the appropriate amount of things like clothes, food and snacks. Before you go make sure dogs are allowed on the trail and follow good etiquette when hiking you’re your dog. Certain places require passes to park at the trailhead and/or overnight camping permits. Make sure you have the proper permits before you go. You should always leave your itinerary with someone and check in with them when you get back. That way they can alert the proper authorities if you don’t return on time. It’s also a good idea to leave your itinerary in the glove box of your car and under the seat. Search and rescue, backcountry rangers and any frequent hikers utter the saying “cotton kills”. When cotton gets wet it will no longer keep you warm and you might as well be wearing nothing. Wearing a cotton shirt to hike in the heat of a summer day is ok but always bring wicking, quick drying, wool or synthetic clothing for the rest of the time. Also, do not wear cotton socks for the same reason plus when they get wet they will rub on your feet like sand paper and make your experience miserable. Remember that both you and your dog will be burning a lot of energy and will need more food and water than you are used to eating and drinking in a day. Remember to bring enough with you and snack and drink water regularly. I pack a couple of no-sodium bouillon cubes to add to Chester and Gretel’s water in case they won’t drink. Sometimes they are just too distracted or are uncomfortable drinking in a strange place and it is very important they drink their water to stay hydrated. Next for us is getting everything ready for the bike tour portion of the trip. This will be the first overnight bike tour ever for Chester and Gretel. This will also be one of my first bike tours and certainly my first with two wiener dogs. We can’t wait! That seems like a lot to carry, but I bet you will have fun! A lot of our gear is the light and compact version. Carrying all of the dogs stuff adds almost 10 lbs though. Have a fantastic time!! Thanks for the mention. Be safe in all your travels. Great information. Thanks for the comprehensive post. 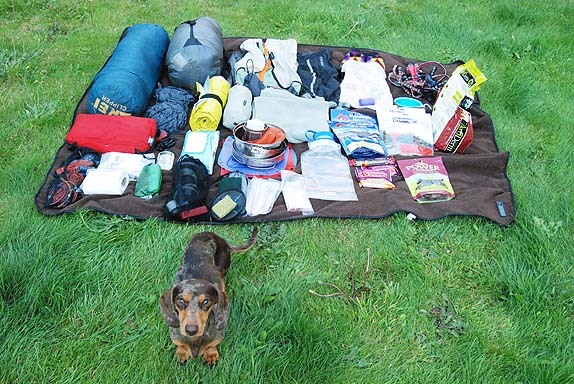 You’ll make backpacking with dogs much easier for a lot of us. Thanks. I didn’t want to bore you with the details of each of the items I carry but wanted to still be somewhat thorough. I’ll just say it is a lot ot carry and helps enormously if you look for the lighter and smaller version of some of the items. Looks like an awesome trip!! We haven’t done camping, but we do day hikes, so not as much stuff is needed, but we always have water and noms!!! 🙂 Have fun! I always bring the 10 essentials even if I am on a dayhike. I liek to think that if I was injured or lost that I could survive at least one night in the woods. I’m impressed! My “adventurewieners” are more like “funbutneedallthecomfortsofhome” so we will live vicariously through your trip. I’ll remember your tips for our next car camping adventure though.